Gor Mahia were held 2-2 by Burundian side Lydia Ludic Burundi Académic FC. Gor Mahia twice had to come from behind to grab the draw. The Burundian side had taken a lead as early as th 3rd minute, before Philemon Otieno equalized. The Burundians then scored again before Jacque Tuyisenge converted an injury time penalty to salvage a draw. 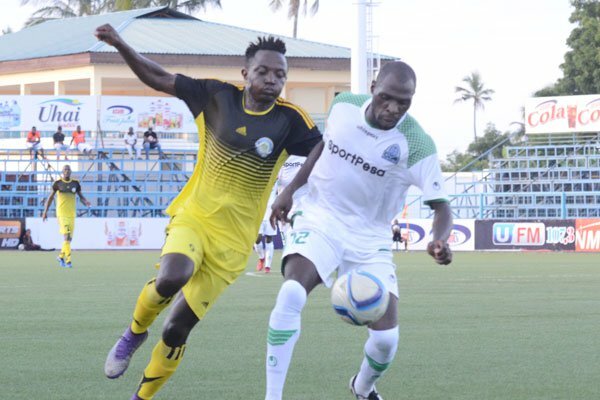 Gor Mahia’s blushes were spared by a 92nd minute Jacques Tuyisenge’s penalty kick as the Kenyan Premier League champions’ Cecafa Kagame Cup dreams were kept alive with a hard fought 2-2 draw against a resilient Lydia Ludic from Burundi, at Chamazi Stadium on Tuesday. Gor, who were a shadow of their former selves left it late as the Burundians looked set to complicate Dylan Kerr’s men quarterfinals qualification chances. The record Kenyan champions had to come twice from behind to go level on points (2) with Ludic and Rayon Sports who drew 1-1 with surprise group B leaders Port of Djibouti in an earlier match at the same venue. This was K’Ogalo’s second draw of the tournament after they had an identical scoreline against Rayon Sports on Sunday. The result has left the group wide open after the Rwandese giants shared the spoils with Ports. “This was a hard fought draw. Credit to Ludic, they made us battle to the end. This was not my team, my team played on Sunday,” said a disappointed Kerr after the match. Gor now face a tricky must win final group match against Ports on Thursday at Chamazi Stadium. Former AFC Leopards duo of Alexie Kitenge and Dan Wagaluka netted a goal each in either half for the Burundians in between Philemon Otieno’s strike. Gor could have gone into the break leading but their profligacy in front of the goal cost them with Ephrem Guikan being the major culprit. The Ivorian had a clear cut chance on the stroke of halftime but he was perfectly denied by Mutombo before a defender made a goal line clearance to stop Jacques Tuyisenge’s goal bound header. Ludic regained the lead in the 53rd minute when Wagaluka shrugged off a challenge from his marker before unleashing a ferocious shot that flew past goalkeeper Shaban Odhoji. Francis Kahata then forced a fine save from the opposing keeper in the 58th minute before he was replaced by new signing Francis Mustafa as Bernard Ondiek came on for Guikan. In the 68th minute, George Odhiambo saw his long range shot punched away by Mutombo. Moments later, Innocent Wafula danced through the defence, but his effort in the box was deflected for a fruitless corner, just before paving way for Samuel Onyango. Ondiek could have drawn level in the 83rd minute but his glancing header went agonizingly wide as Gor intensified their attack in search for an equaliser. But with less than three minutes to stoppage time, Gor were awarded a penalty after Ludic defender handled the ball in the area. Tuyisenge made no mistake to send the keeper the wrong way and keep God’s quarterfinals hopes alive. Good job….remember no pay = no goals mantra , keep up with the draws, until the EC pays up once more…….why win only for EC eat all the money ? Gor mahia will not go far in this tournament.Something is not adding up………. I agree something is not adding up. Truth be told something is obviously wrong somewhere, who is this Lydia from Burundi? So Gor has stooped so low as to be beaten by such unknown small team from the politically unstable country. The earlier we quit the better rather than being humiliated by small unknown teams.2-2 is nothing but a win for Lydia against the mighty Kogalo.Match fixing by Gor players maybe a possibility here in reaction to mistreatment by the ever greedy EC led by Rachier. Coach Ker should relax. It is reported that he is quite upset with today’s results. We K’Ogalo fans are relaxed about these results. We understand the cause of all these. The coach has done his bit so have the boys. Vijana shikilieni hapo hapo. Msicheze. Bado mapambano mapambano mapambano. The EC who are responsible for all these should be fielded in our next match against Djibouti ndiyo wapate kuexperience what it feels to sweat and toil in that K’Ogalo jersey. We all know what is not adding up and do not be cheated it’s fatigue, it’s not. I was expecting a loss against Lydia so that we could return home and sort out our money issues. The earlier we do so, the better before we meet Simba, Yanga, Azam or APR. Let the team grind these draws as much as possible. What is the point winning tournaments and confederations and never getting paid? No wonder we will soon lose Kahata and Wendo. Mind you, Musa has chosen Nkana over Gor. To the players in Tanzania, please lose by a 1-0 margin against your next opponent and return home. Rachier won’t pay you even if you win that tournament. The 27m from CAF is being spent in Russia. The sportpesa supercup money is being eaten in Moscow. Don’t win another trophy please. I hate to see what is happening but for the sake of the players welfare I side with them. The sooner the “milkmen” realise there will be no money the better. How do you enter a tournament to line your pockets. Why should these milkmen earn a salary from the club. Given that the club does not have any major sources of income it is so shameful that the EC members earn salaries. Surely how low does one stoop. On my opinion only the technical bench and the executive running the club should earn salaries. The rest should be on volunteer basis. Yes, the club should cater for their travelling allowances but thats it. This club needs an auditor ASAP. The moment employers start taking employees for granted, what do you expect? Poor results. That’s what we are seeing. No motivation, poor results. This issue of fatigue is just being blown out proportion, even if you give these players 2wks off, you will still find them playing friendlies/tournaments mtaani, dago,ziwani, camp toyoyo, kibera etc, why?? ?, bcoz they love to play.Fatigue is managed by rotating the squad not necessarily benching the whole team bt substituting players who have played the most in the 2nd half or 50th-60th minute or allowing them to come in, in the last 15 minutes. If all the players had played the 4games in the last seven days, the issue of fatigue would really make sense.Initially the coach had faith in rotating players what happened, fear of loosing???? The system played was 4-3-3 with Guikan , Tuisenge and BB attacking but our common is 4-2-2 which played against Rayon( Guikan and Tuisege Attacking). The first Goal was a back pass which the striker intercept with one defender out position and a goal keeper to beat. GM reaction was great after this and a team goal was scored. I did not notice any laxity on players sides. Guikan, tuisenge, kahata , wafula and bb all tried their best but were denied by good keeper and outstanding defender call otieno. Yes players have issues but as professionals they know how to handle them under captain Shakava. Let us not create great grave issues which are not their. Soon we will overcome this and great things will happen. We were lucky to have a draw but soldiers fought. Positive builds and negative talks destroys. Yes…keep it right here….theres no need of complaining about what you can’t change…lets expect positive results always…thank God for the draw…a loss would be so painful. Let’s cheer on the team as fans even when the goin gets tougg..
Macholung I don’t know which match you watched to say Kahata fought. The guy lost the ball on so many occasions including the backpass gor the early goal. Go and watch the match again and tell me who Kahata was giving that backpass because there was no Gor Mahia defender where he put the ball but Alexis Kitenge who took Kahata’s assist with glee and planted beyond Shaban. Shaban played a very solid Supercup even winning the Golden Glove but when is he ever going to stop conceding so many goals? Finally, Kerr has over 27 players why should he insist on fielding the same ones then complain of fatigue. He said he does not need to sign any new players because he is satisfied with the ones he has so why is he not trusting the other so called fringe players who incidentally won the Supercup last year!!! God bless you. Amongst the negativity…there will be good news. God bless the players. God bless For. Gor will not fall. We pay and win. @macholung… correction,there is no 4-2-2 system in soccer. Then am not sure if we are blaming the system or the players but one thing is for sure,the tournament will not be easy under the circumstances!! When God created Wo/Man , he was very specific on what faculties should be used in specific situations . The heart was to be used for pumping blood , Love and Emotions , while the head was to be used for thinking theiren finding solutions . The issue at hand is clearly a matter for the head and not the heart . Gor Mahia exclusive of the EC and the Players is the only constant in this equation coz the EC just like the players will come and go but the club will remain forever and hence when we are discussing the issue , we must be careful not to mix the two , otherwise we end up with short term emotional solutions to long term problems that in the fullness of time end up muddying the CV of the club . Ten to Fifteen years from now , I want to read that Gor participated in the 2018 cecafa cup and won it and by then this present EC members will all be gone and hopefully dead , the players will be long gone but the history they would have created will remain etched in the annals of history and that I believe should be the basis of our submissions . To what positive effect does telling the players to lose the game have ?, how does it benefit the club, its history and its future . These players , inspite of the current challenges have a future to think about and serious scouts to impress and it is in such international platforms that they get those opportunities , its at one of those platforms that Simba probably saw kagere despite the fact that he was having contract challenges at then , that little time you have in Gor , in that short career that you have , is all the time that you the players have , using it to the best of your ability is not to say that you have approved of the shenanigans that is the EC . So my advise to the players is that you are caught between a rock and a hard place and this is where the head comes in , talk to a majority of the Africans players plying their trade in the big leagues in Europe and you will be surprised at what challenges they had to overcome, Remember that next time somebody tells you to intentionally lose a game bcoz wnen you do , the only thing you will end up massaging is your ego and not your career . Spot on @ teddy sofaset branch entebe tell them we need people thinking outside the box like you and not myopic thinkers who turns to be prophets of doom.It is true there are thieves in the EC and I believe there are bloggers who can petition EACC to come and investigate the Club those Officials responsible for milking this Club of it’s little revenues instead of inciting players to lose their hard fought games. Gor will draw tomorrow’s match and leave Cecafa,I can bet on this.